Pope Francis tweeted his first-ever photo on Friday in a powerful display of solidarity with humanitarian efforts in Iraq. 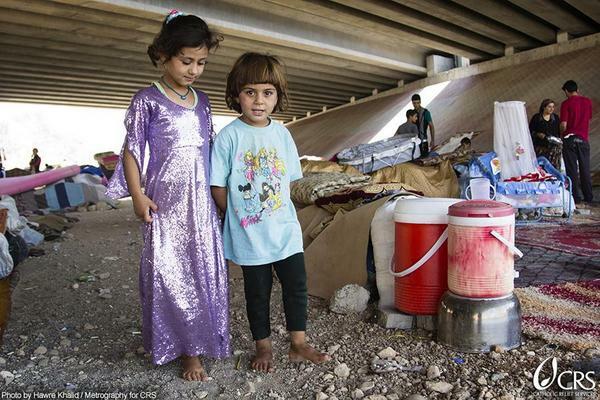 The image, originally tweeted by Catholic Relief Services, shows two children from Yazidi families who have taken cover under a highway overpass outside Erbil to escape violence by Islamic State militants. CRS reports that roughly two million people have been displaced in central Iraq -- one million, alone, since the beginning of the year. Many of them are Christians, Yazidis and other religious minorities who the Islamic State has targeted with its attacks. Pope Francis spoke on his "dismay and disbelief" over the atrocities in Iraq, saying in an August address, "Hatred is not to be carried in the name of God! War is not to be waged in the name of God!" On August 19 the pope personally called Fr. Behnam Benoka, a priest working in an Iraqi shelter, to offer his support and prayers. "Know that I am with you in prayer always," the pope reportedly said. "I never forget you." Pope Francis took his message a step further on September 3 to address Iraqi Christians directly in his weekly general audience. Francis called Iraq's persecuted Christians the "heart" of the church and said the Catholic Church would "defend her defenseless and persecuted children" like a mother. "The church suffers with you and is proud of you," Pope Francis said.